Wool author Hugh Howey on fan fiction and Kurt Vonnegut. On training wheels, fan fiction, and stories in the cave. Peace In Amber, by Hugh Howey. If these are the end times for literature, then we must be traveling in circles, for the death of storytelling looks an awful lot like its birth. The novel itself isn’t all that old. Sure, we can find a handful of examples going back thousands of years, but you have to stretch your definition of novel the further back you go. Really, the idea of an immutable and unchangeable text dates only to the printing press. Before that, every scribe tasked with producing a tome thought he was an author. Like movie producers dabbling with plot, it was difficult for the hand-copiers of text not to make a tweak here or there. Books were ever-changing. Stories evolved. And that was the way things were until Gutenberg’s time. Fast forward to 2012, where 1 out of every 5 books sold was part of the 50 Shades of Grey series. Originally a work of Twilight fan fiction, the monumental success of 50 Shades of Grey turned a spotlight on the shadowy world of fan-generated literature. Soon, publishers were seeking out other popular works of fan fiction and signing authors to mega deals. Then Amazon announced its Kindle Worlds program, which commercialized fan fiction and opened up licensed worlds for exploration. To purists—who mix a love of history with a thin understanding of the past—the sanctity of the written word was in jeopardy. It was raining frogs. The volcanoes were angry. These lovers of the very modern novel clamored for a return to our roots. And yet—that is precisely where we are heading. Although no written account remains (writing wasn’t invented yet), it is safe to assume that fan fiction was invented about five minutes after the first story was told. A cave echoed with a riveting account of a great beast felled, and someone in the audience was already thinking of an improvement or a twist. These twists became part of the story as it moved through time and space; original storytellers relied on their imperfect memories, which promoted the flow and evolution of tales and allowed each one to be shaped to its audience. The oldest stories we know of, like Homer’s The Odyssey, were likely written by the collaboration of many and were the end result of thousands of varied retellings. Lovers of the new and immutable novel may fear the end times, but ironically the end times themselves were a work of fan fiction. The four Gospels were written well after the times they describe, and each has its own take on similar events. (It used to bother me that the Gospels disagreed on so much. But then I discovered Batman comics and saw how often the Caped Crusader’s origins and backstory also changed over time.) Shakespeare made a career out of fan fiction. Wealthy patrons would request a new stab at a familiar story, and the Bard would comply. Or he would draw upon historical facts and people to make fiction from the real. How is historical fiction, for that matter, different from fan fiction? After all, any hack can borrow the known world—whether historical or contemporary—and write a quick masterpiece. But of course it isn’t so simple. The writing is still the hard bit. Whether an author takes as their inspiration the life of Henry VIII or their own traumatic childhood or Batman’s traumatic childhood, they still have to fashion an engaging plot, realistic dialog, and pleasing prose. That’s the challenge, not the original idea. Ideas are cheap. Stories are dear. My own involvement in fan fiction came about in a peculiar way. Peculiar, in that I never thought I’d write something that anyone other than my mom would ever want to read. So when my series Wool became unexpectedly popular, and fans got in touch to ask if they could write in this world I’d created, I was taken aback. But I agreed. And then I suggested—not knowing this was taboo—that they charge a buck or so for their story. My thinking was that artists deserve to be remunerated for their efforts. So began what became quite an impressive collection of fan fiction written in my world, a happening I would never have dreamed possible. 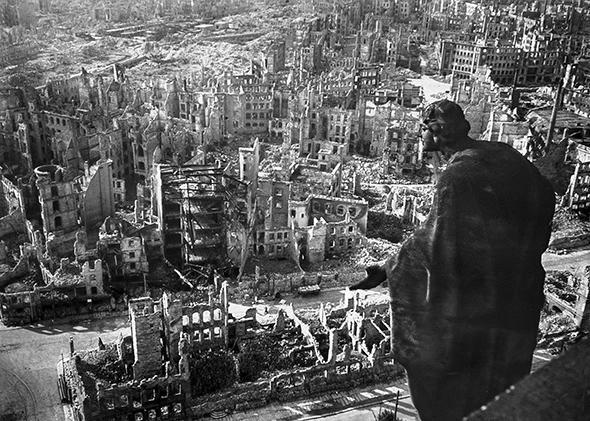 Dresden’s destroyed Old Town after the allied bombings in February 1945. Last year I sat down to write my first piece of fan fiction. I chose Kurt Vonnegut’s Slaughterhouse-Five, as this was a world newly opened for exploration and a novel very dear to me. I had read Slaughterhouse-Five in high school and didn’t really get it. And then a few years ago, I studied the work again, and the story had not just meaning but special meaning. I saw the author working through personal trauma by writing about it obliquely. Vonnegut’s didactic work helped me through a similar trauma. With my first work of fan fiction, I chose to use his example of writing about the bombing of Dresden in order to confront my 9/11 experiences—an event I’ve long avoided discussing directly. And what I discovered surprised me. Fan fiction is difficult. More difficult than the dozen or so novels I’d previously written. Before composing Peace in Amber, I used to liken fan fiction to writing with training wheels. The idea was that one could learn to pedal and balance and eventually discover that they didn’t need the extra wheels anymore. The writer could take them off and create their own worlds. This analogy is still partly true, but what I found while writing my work was that the training wheels get in the way more than they help. They catch on lampposts and bushes. They make it so the writer can’t lean and steer the plot where it needs to go. The original work limits with its history and its established facts. Peace in Amber was the hardest thing I’ve ever written, and only partly because of the subject matter. What made it difficult also made it rewarding. I was crafting an homage to one of the greats. I was also coming to grips with my pain much as Vonnegut must have. What we are approaching now is a return to the storytelling of old. We are marching back to a world of stories in the ether, a world where bards speak once again to a live audience and are able to gauge their reactions, a world where we may learn and adjust our craft on the fly. We are getting back to a time when the audience and the storyteller enjoyed a symbiotic relationship, when a fan could become an artist, when the listener might go on to speak for themselves. This is the story I see unfolding before us. I see a return to campfires and caves and sharing. I see stories that will grow and become timeless not because they were stamped in a press but because they bear the stamp of us. This is a message of tolerance and acceptance that I hope will spread. Pass it along if you care. Feel free to give it your own twist. I won’t mind at all. Hugh Howey will be appearing live with Slate’s Dan Kois and Hanna Rosin to discuss Slaughterhouse-Five and Kurt Vonnegut Tuesday, Feb. 27 in Seattle. 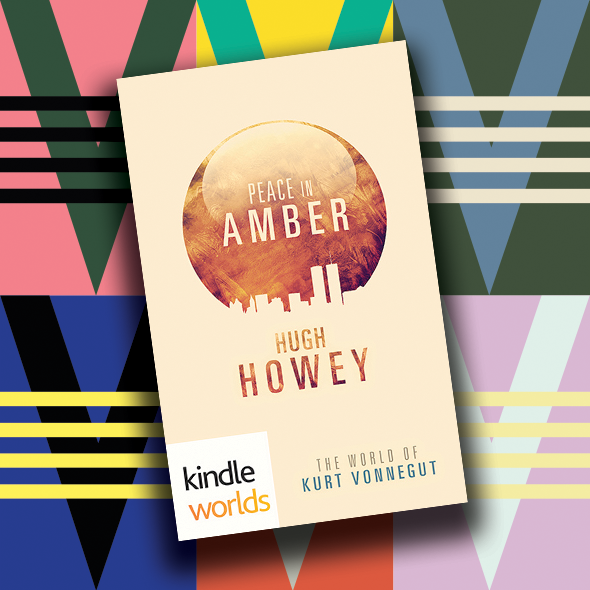 Peace in Amber by Hugh Howey. Kindle Worlds.